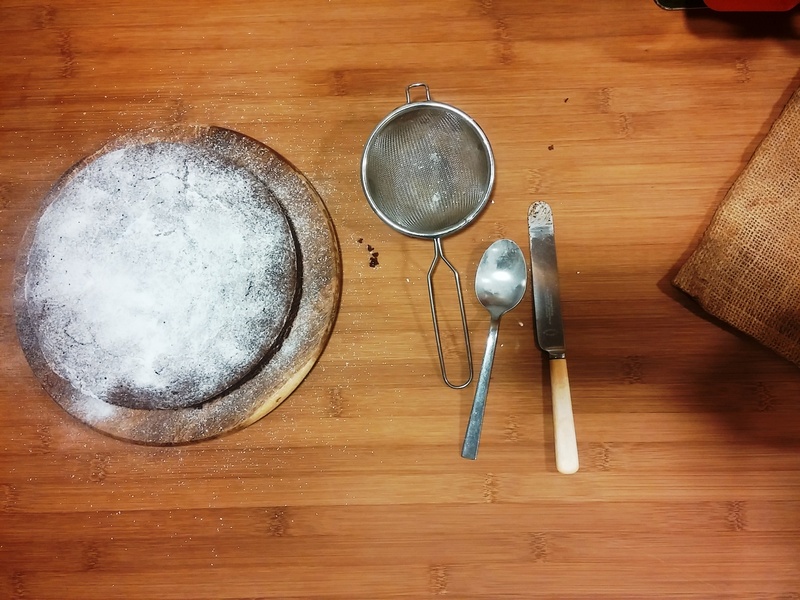 So this isn’t very Christmassy, but I’ve wanted to try making a kladdkaka for a while. I really must get a Swedish or Scandinavian baking book as I’m enjoying everthing I try making from recipes from that part of the world. 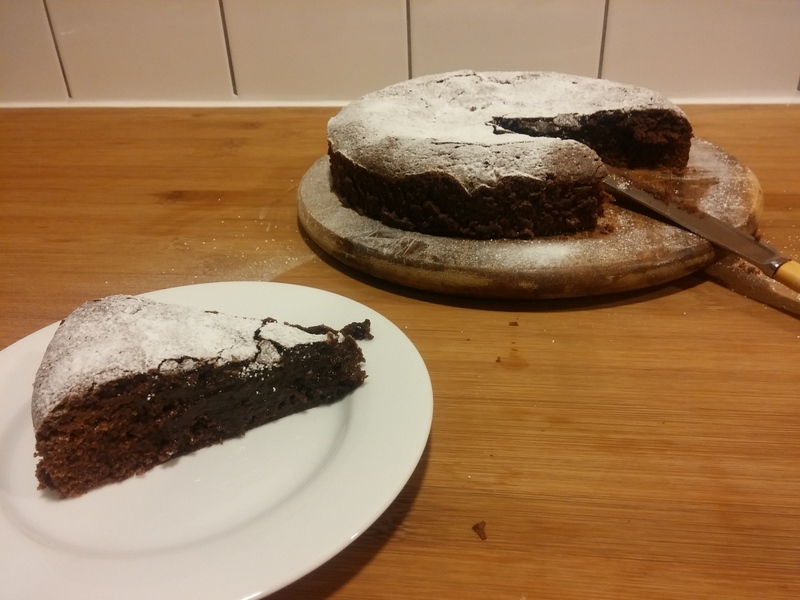 Kladdkaka is a kind of gooey chocolate cake. It’s unleavened – no baking powder, no soda, no yeast, so it’s not intended to be light and airy. Instead, the aim seems to be to basically leave the inside somewhat unbaked, so it’s moist to the point of runny, so it’s not unrelated to things like chocolate fondant and brownie. In English, it can be called mud cake, but from what I can tell from online dictionaries, kladd means either draft, or rough, or daub, something a bit messy and unfinished, or goo, gunk. A Swedish-speaking friend meanwhile (he’s Finnish but is one of those annoying types who speaks multiple languages perfectly) says that “If something is ‘kladdigt’ it’s sticky, gooey, doughy, maybe even messy.” Thanks. Tom. 2. Grease and line a round tin, ideally 18cm or 20cm (7 or 8 inch). 3. Melt the butter then remove from the heat. 4. Sieve the cocoa and plain flour into mixing bowl. 5. Beat together the eggs and vanilla. 6. Pour the butter and egg mix into the flour, and beat together with the sugar until the mixture is combined. 7. Pour the mixture into the tin then bake for around 20-30 minutes. This is the important bit and will vary depending on the character of your oven. You want it to start pulling away from the edges of the tin, but not be baked dry in the middle. 8. Cool in the tin for about 20 minutes, then turn out. You can eat it warm, with ice cream or whipped cream. I had mine with custard, though I doubt Swedes do this; we just had some fresh custard in the fridge that needed me to nobly step in to finish it. It’s also very nice cooled completely, to a more truffle-like texture, and eaten with a cuppa.